Designed to be attached to one another. Standard color is yellow. • Xtra Duty gates do not loose any height when the gate is extended. • Vertical channels are attached to one another with shears. Two rows of shears are provided for gates 5’-8’ high, gates 8’-12’ have three rows of shears. • A cylinder lock is standard on all models (cylinders cost extra and can be keyed, blank or thumb turn). • More than twice the weight and strength of a standard lazy tong gate. • If both tracks are folding, the entire gate with the tracks can pivot out of the opening. • With single gates a locking bar equal to the height of the gate is attached to the wall opposite the side where the gate is attached. 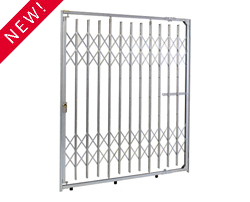 With pair gates, the locking bar is integrated into the design. • Track can be mounted to the ceiling or face mounted to the wall with special angle brackets. • Maximum height 12’, minimum 5’. • Maximum width – single 16’, pair 32’. • Available to stack in line or pivot. • Top track is self supporting. • Maximum height 12’, minimum 4’. • Maximum width single 16’, pair 20’. • Maximum height 8’, minimum 5’. • Height 6’6”. • Width 3’-6’, 6’-9’, 7’-12’, 11’-15’, 13’-18’. Wall mount – comes with two 6” locking bars. Floor mount – comes with two brass floor anchors. Pressure fit – no mounting hardware required, locking mechanism creates pressure on opposing walls with rubber bumpers. Gate can be locked in a pressurized position. Are Window Gates A Good Security Investment?